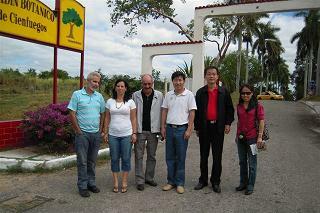 During November 12-20, Prof. Chen Jin and his entourage Dr. Hu Huabin and Ms. Hu Jianxiang paid a visit to Jardín Botánico de Cienfuegos (Cienfuegos Botanical Garden) at the invitation of its director Dr. Lazaro J. O. Quintana. Dr. Chen Jin was invited as a keynote speaker at the celebratory scientific conference marking the 110 years’ anniversary of the Garden. The conference, themed with “Role of botanic gardens in the conservation of the plant biological diversity”, was held from November 18-20, covering such topics as economic botany, environmental education, biodiversity conservation, horticulture, ecology, landscape building, phytogenetical resources, role of botanical gardens in conservation and sustainable development, etc. Dr. Chen Jin and Dr. Hu Huabin were invited to chair sessions of the conference respectively. During the visit at Cienfuegos Botanical Garden, Dr. Chen Jin met with executives of the Garden and discussed such work as gardening, public education, and scientific research. A cooperation agreement was signed between the two sides. In addition, XTBG delegation introduced some plant species from Cienfuegos Botanical Garden. 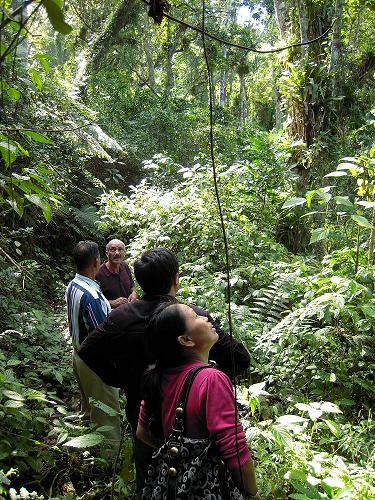 They also visited Topes de Collantes Great Natural Park, an area of Cuba boasting lush vegetation. In September 2009, Dr. Lazaro J. O. Quintana, director of Jardín Botánico de Cienfuegos, headed up a 3-person delegation to visit XTBG for the first time.